Vennings - The Bulk Grain Handling Specialists. 02 Nov 2018 | Quad View Monitor & Camera Kits for air seeders, headers, trucks, chaser bins etc. Vennings "The Bulk Grain Handling Specialists"
Vennings is the longest family owned and operated bulk grain handling retailer and subsequently manufacturer in Australia. Vennings was first established as a blacksmith business in 1904 by “Bill” Venning. 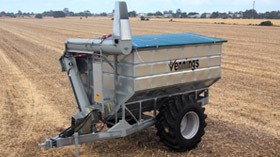 Over the years Vennings have diversified into farm machinery, fuel distribution & vehicles, amongst other things. The company's head office is at 40 Moonta Road Kadina. 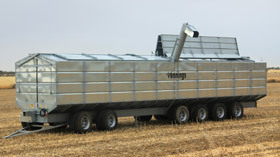 This is where Vennings now manufacture the range of augers. 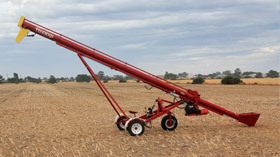 Since 1994 over 4000 of the very popular self-propelled augers have been made and have been sold in every state and exported to 5 overseas countries. The 40 Moonta Road Kadina business also stocks a huge selection of hand and electrical tools, safety, engineering, trailer and tyre changing equipment. Our other factory, Venning Engineering Pty Ltd, is at 11 Martin Tce, Kadina was purchased from A. D. Redding in 1982 that had been making bins and components for Vennings distribution since 1951. Products made at Martin Tce include seed and super combination units, chassis bins from 33 tons to 120 tons, chaser bins from 8 tons to 28 tons, grain cleaners, seed grain silos and cattle and sheep feeders are the main product lines. Together, Robert and Richard have over 100 years' experience in the bulk handling business and are very proud of the companies' achievements. Vennings is a major employer within the Kadina district, employing a constant 35 employees and peaking at 50 during high production periods. "Got The Lot Tool Shop"